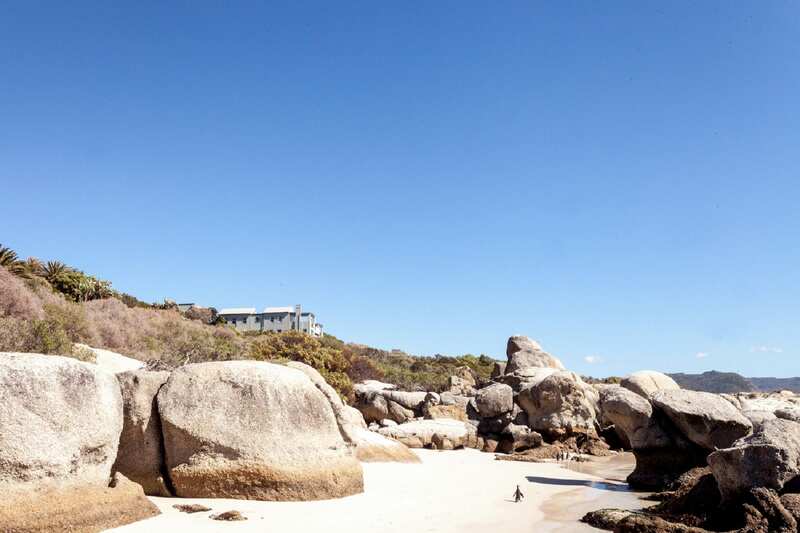 Tintswalo launches Boulders boutique villa on Cape Peninsula’s world famous “penguin beach” | Eat. Play. Drink. Cape Town. BETWEEN Simon’s Town and Cape Point, you’ll find Boulders Beach; how it got its name is obvious from the giant granite rocks that protect sheltered coves. The beach itself is part of Table Mountain National Park, and is home to the endangered and protected African penguins who settled there back in the 1980s. Endemic to the coastlines of Southern Africa (South Africa and Namibia) these penguins are under the protection of Cape Nature which is infinitely better than being under the protection of the Mob. The Boulders section of TMNP – part of SANpark or South African National Parks – consists of three pristine beaches, one penguin viewing area and three boardwalks. The boardwalks were built to allow for viewing of the birds while keeping spectators at a safe and respectful distance for both parties. Access to this area is almost on the doorstep of the newly-opened Tintswalo Boulders boutique villa. 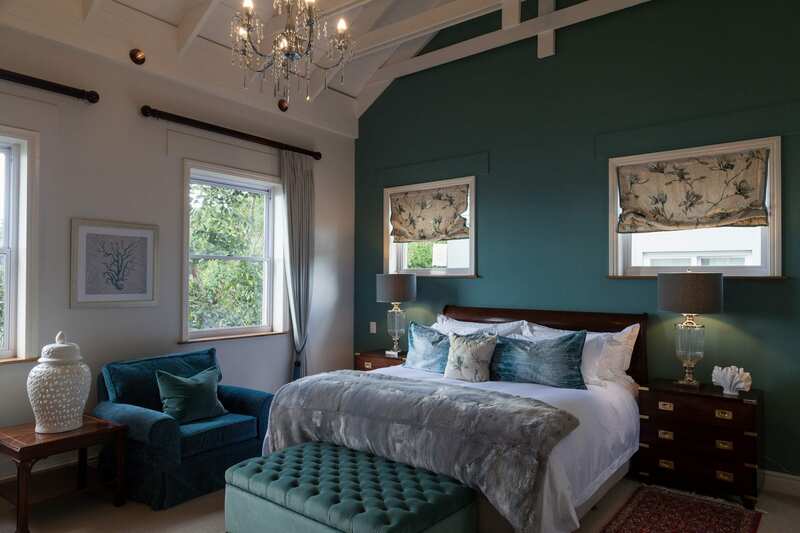 The villa is the latest addition to the Tintswalo Lodges portfolio of luxury lodges and boutique hotels that are all set in iconic locations. The collection of family-owned and run properties includes Tintswalo Atlantic in Hout Bay, Tintswalo Safari Lodge and Tintswalo Manor House in the Manyeleti Private Game Reserve, and luxury tented camp Tintswalo at Lapalala Wilderness in the Waterberg region (Limpopo province). With nine double suites and a children’s suite, Tintswalo Boulders can sleep 18 adults and two little ones; one of those suites has two queen beds so you could probably push up the numbers. 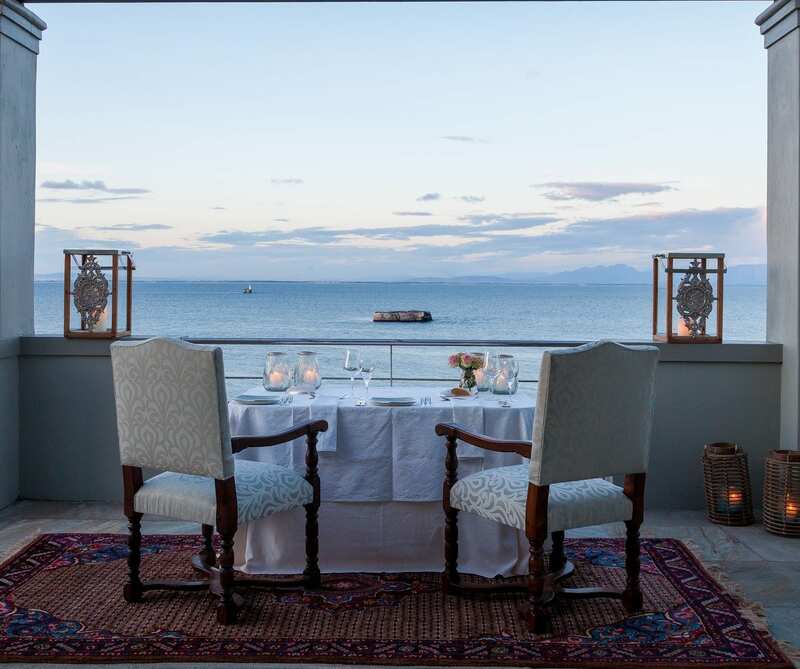 Once two houses now combined in a renovation, rebuilding and decorating feat which took only a remarkable two months, the villa can be booked in its entirety or split into two; each side has its own kitchen and communal living and dining areas, as well as deep, verandas overlooking False Bay. A small pool on the upper deck, as well as a fire pit in the courtyard, service the whole property. Guests can cook for themselves in the fabulous life-goal kitchen, or a private chef can be added to the bill to dish up delicious dinners and lunches. 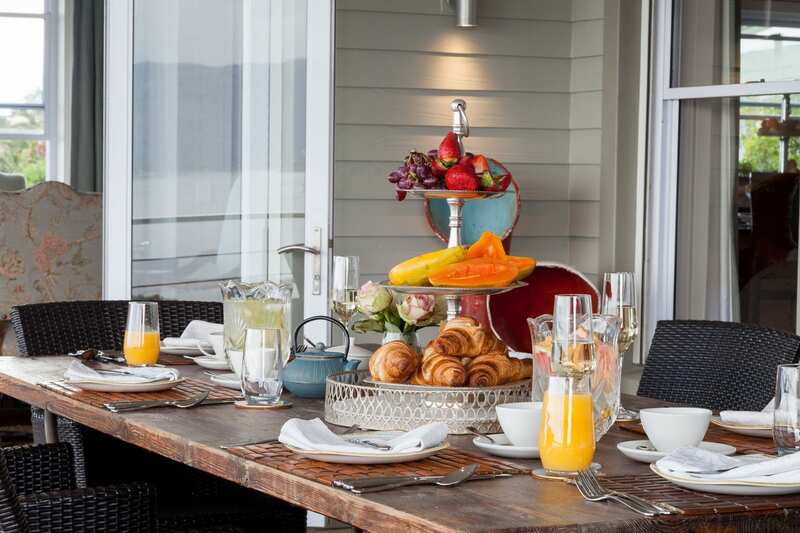 A sumptuous breakfast buffet complemented by a hot meal made to order is included in your stay, as are afternoon snacks, which is terribly civilised. You get complimentary wifi, and you can book an in-room spa treatment. Next year, they’ll be adding a flotation tank. Beautiful interior design and décor is a trademark of the Tintswalo brand and this villa is no exception. There is incredible attention to detail throughout, and the mood is distinctly sophisticated seaside holiday. Each suite is named after a famous ship; mine was Mary Rose and clearly the best suite in the house. Glass double doors open up onto a deck, and two short flights of stairs lead to a gate which in turn allows access to the pathway to the beach and the penguin boardwalk. The massive four-poster bed contains a startling 14 pillows and cushions (most of which were discreetly whisked away at turn-down) and there was an antique “ladder” to help a person climb up. The windows have black out shutters which are most welcome as the suite faces the rising sun. There is a large dressing room which will suit long term guests. In there, you’ll also find the extensive mini bar and coffee/tea making facilities (including fresh milk in the fridge), as well as robes and fabulously squishy slippers which murmur “luxury” as you slide your feet into them. After that is the huge bathroom with double vanity and a bath in which sea shells are arranged to spell out the words “save H20”; I rearranged them into a smiley heart which may or may not have amused housekeeping. There’s still more, though: another short corridor to the shower and loo, all in all making my accommodation probably bigger than my entire flat. I was impressed by the numerous thoughtful touches which add that little bit extra when it comes to ensuring a comfortable stay. I’ve never used one, but I’m sure a diffuser attachment for the hairdryer will be appreciated by those who do, and the magazines were the kind I like to read (no Golf Digest, no offense). While simply spending time in the villa is a tonic for the soul, if you need to spread your adventurous wings a bit, a concierge service is offered for snorkeling safaris and guided sea kayaking excursions, as well as bookings at restaurants. An opening special is available until March 31, 2019, offering a complimentary third night when booking a two-night stay (peak season block out period December 15 – January 15 applies). Low season rate is from R2500 per room per night and high season from R3000 per room per night including full breakfast and afternoon snacks. Exclusive-use of the villa is from R24 000 per night (excluding all meals). A minimum stay of three nights is required for exclusive-use bookings.